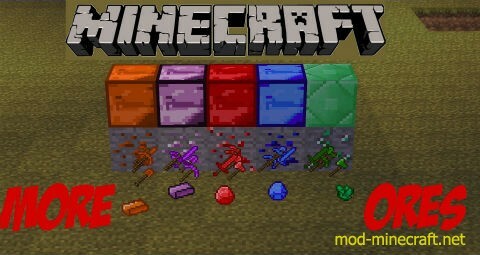 M-Ore Mod is specially made for you if you are tired of the old ore or if you just want more ores. With its new materials, you can craft tools with copper, bronze, ruby, sapphire, stainless steel, silver and you can also upgrade your iron tools by crafting it with meteorite. In this mod you can make an armor with bronze, ruby, titanium and silver. You can’t find bronze and stainless steel in caves, but you can craft them. 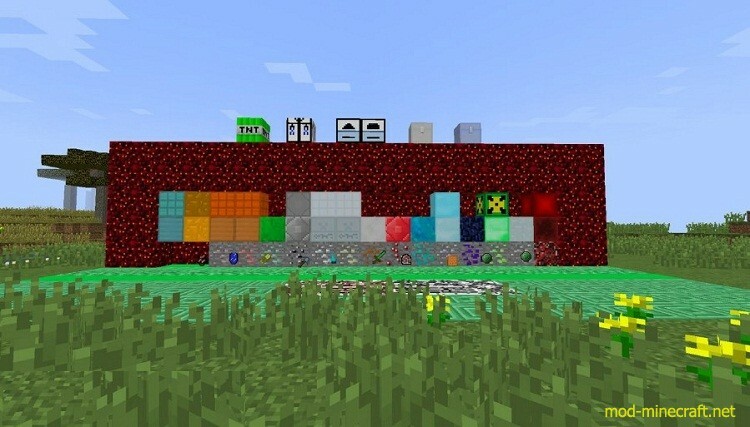 You can find Chrome ore in the Nether and in the End, Platinum ore in caves, Silver ore in swamp biome, Granite in extremeHills biome, Red Granite in the Nether. URANIUM TNT. 5 uranium ingots, 4 sand blocks. 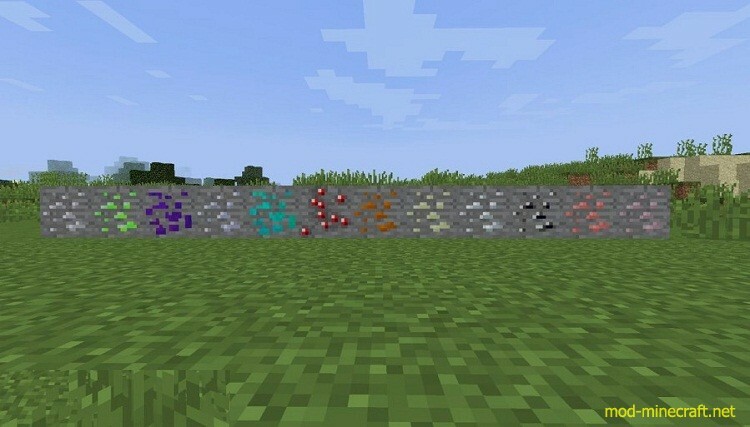 List of ores from left to right: Zinc, Uranium, Titanium, Platinum, Sapphire, Ruby, Bauxite, Electrum, Silver, Cassiterite, Cuprite, Copper. Tools are made of copper, bronze, silver, malachite, ruby, sapphire, aluminum, stainless steel and platinum. 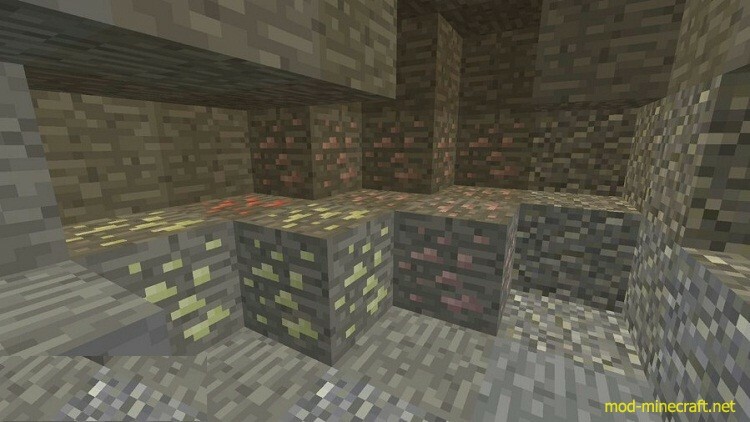 Platinum is the most rare ore in the mod, and tools and armor made of it are the best. Armor can be made using bronze, silver, aluminum, titanium and platinum. You can make tools and armor using bronze, they are little better than iron. It is possible to craft 9 ingots into 1 block, to store it for later. Another sword which gets enchantment is silver. It has Bane of Arthropods enchantment. You can craft bowls using silver, and then make a mushroom stew. The advantage of silver bowl is that it stacks. To make processing machines you have to craft inventor’s table first. Crafting recipes of uranium furnace and uranium compressor. The machines require uranium ingots as fuel, and water to stop heating. Make flasks in inventor’s table, fill them with water, and put them in special slot. Uranium furnace smelts everything usual furnace does, but it gives 2 times more ingots when you smelt ores. Titanium ore can only be smelt in uranium furnace. Uranium compressor is needed to make plates (copper, chrome, platinum, silver, tin, uranium, bronze, gold, iron and stainless steel). Saw does everything an axe can, but when you chop the first tree log, the tree will fall. Saw can be made of bronze, silver, platinum, iron, gold, diamond, ruby, sapphire and stainless steel. You can make silver and platinum chests in Inventor’s table. Just put 8 ingots like you do when you craft wooden one. They are more resistant than wooden chest.